Enfamil A.R. Infant Formula is specially formulated with a thicker consistency clinically proven to reduce spit-up by over 50%* while providing complete nutrition for your infant up to 12 months, unlike just adding rice cereal to formula. Spit-up is common side effect of your baby's developing digestive system. But a switch to Enfamil A.R. Infant Formula can make a difference. *Based on a clinical study of Enfamil A.R. Infant Formula before the addition of DFIA, ARA, and prebiotics with infants who spit up frequently (5 or more spit-ups per day), comparing frequency and volume of spit up after feeding Enfamil A.R. 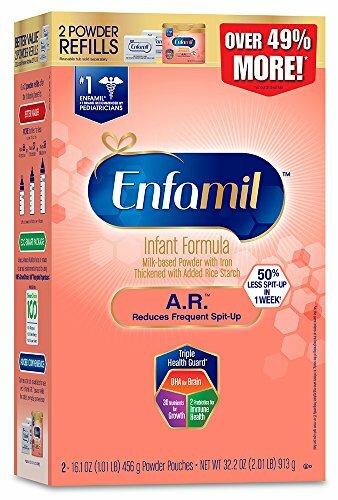 to the same babies at the beginning of the study **Enfamil is the #1 pediatrician recommended brand of Infant Formula - QuintilesIMS, using the ProVoice Survey fielded from October 1, 2016 to September 30, 2017.